Why does L'Ambizioso tour the nation? L'Ambizioso was founded with the purpose of performing in rural communities around the Midwest that rarely have access to touring music. 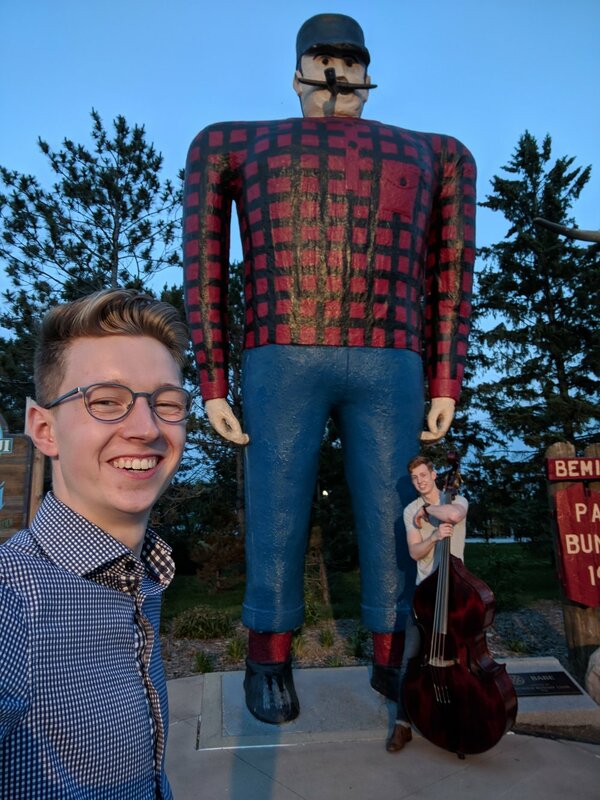 Both Brayden and Brock come from a smaller town in northern Minnesota and always desired touring music to visit their region. 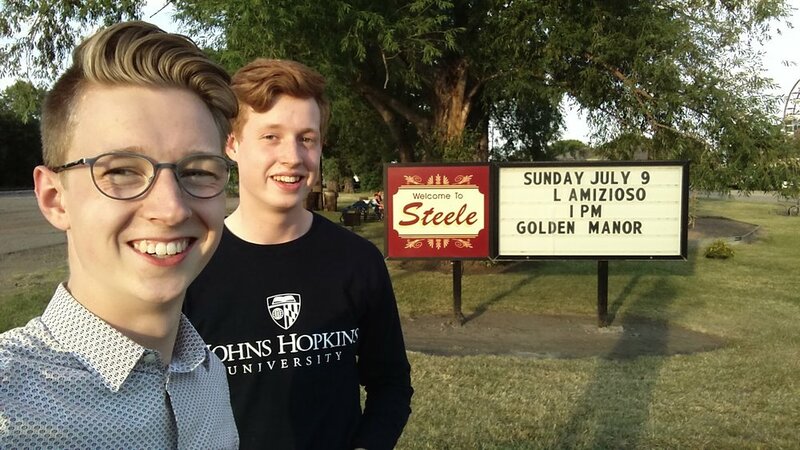 As professional musicians now, Brayden and Brock formed L'Ambizioso Duo to accomplish that goal with sponsorship from the Minnesota Arts Council. What makes L'Ambizioso special? L'Ambizioso is special for three main reasons. They are the only touring piano/bass duo in the nation, they engage audiences with tantalizing musical twists, and they share narratives of fascinating stories. As the only touring piano/bass duo, they bring classical music to life with fiery arrangements and selections, utilizing the rarely-used upper register of the bass. To engage audiences, they usually perform a piece in which they humorously call someone up on stage to play along. They tell stories ranging from the interesting history of specific pieces, to personal stories such as performing atop sunny mountains in California and performance-coaching their sister to win the talent category at the Miss America pageant. Notably, L'Ambizioso produces a unique high singing sound on the unsuspectingly low bass instrument. Why does L'Ambizioso perform in churches around the Midwest? L'Ambizioso likes to perform in churches because it is a good community space, especially in small communities. 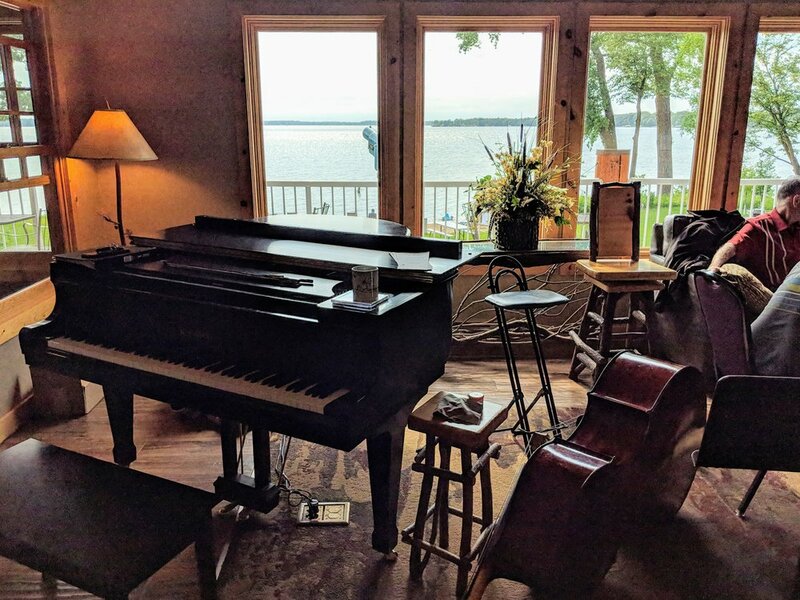 Additionally, considering that L'Ambizioso does not haul along a heavy piano on tour around the Midwest, local churches often have the best pianos (and acoustics) in rural communities. Does hosting a concert require volunteers? Unless you plan to put on a light reception afterward (bars and coffee, etc), volunteers are not required. Do we have to put on a reception after the concert? Receptions are not required, but many venues decide to have them. It is a great opportunity to greet and meet audience members. Past venues have been creative with receptions, ranging from bars and coffee to ice cream socials! Does L'Ambizioso need a sound system? In an effort to reduce venue requirements, we usually do not require a sound system. Rather, we just play and speak louder. However, if the venue or audience is on the larger side, we ask venues to use their best judgement. What are the bare requirements of hosting a concert? Simply have someone open the church doors an hour before the concert so that L'Ambizioso can set up the piano and bass for their 1-hour concert in the sanctuary. Receptions are not required. How do most churches host L'Ambizioso? Most churches have someone open the church doors an hour before the concert. The pastor usually introduces L'Ambizioso and may lead an opening prayer. A church group (choir, women's group, etc) manages a light reception, with coffee/lemonade and homemade bars/cookies. What promotional materials are provided? In an effort to make hosting as easy as possible for the church, L'Ambizioso provides bulletin inserts, poster PDFs, and a press release. How does L'Ambizioso help to promote concerts? L'Ambizioso uses a portion of their grant from the Minnesota Arts Council to fund digital promotion through Facebook and Instagram. They also reach out to other groups within the community, like school music educators. How do we book a concert? L'Ambizioso recently launched a new booking platform (see above). This platform gives venues much flexibility in selecting a concert date that works into their schedule. They simply ask venues to select a date near another L'Ambizioso concert in your region, as to make the tour schedule more efficient. Please reach out via the contact form if you have any questions or concerns about finding a date. The concert is booked. What's next? The hardest part is done! L'Ambizioso will send promotional material as the event date gets closer, as well as coordinate any promotion efforts. They will send a PDF with suggestions of who to reach out to, as well as recommended timelines. While this is not required, it helps significantly in getting the word out and is designed for your ease. Most churches begin to mention the concert via the bulletin or spoken announcements around two months out. In the weeks proceeding the concert, L'Ambizioso will promote the event through social media (Facebook, Instagram, etc) and other avenues. How many people come to a typical L'Ambizioso concert? L'Ambizioso concerts usually draw between 30-100 people from within the community and surrounding area. They have performed for everyone from locals to foreigners visiting town. Does L'Ambizioso do any charity or outreach? L'Ambizioso's mission is to bring touring music to populations that rarely have access to such music. 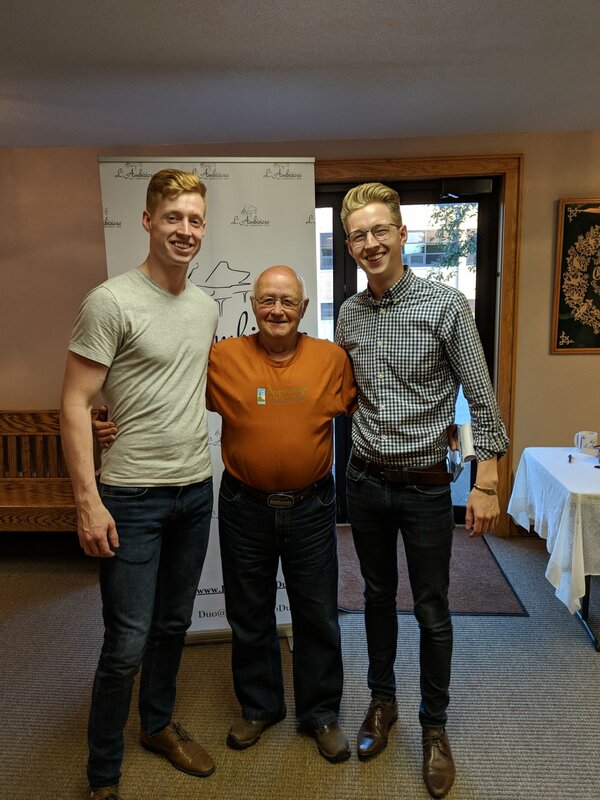 Beside performing concerts in rural communities around the Midwest, L'Ambizioso enjoys performing in local nursing/retirement homes along the tour route. 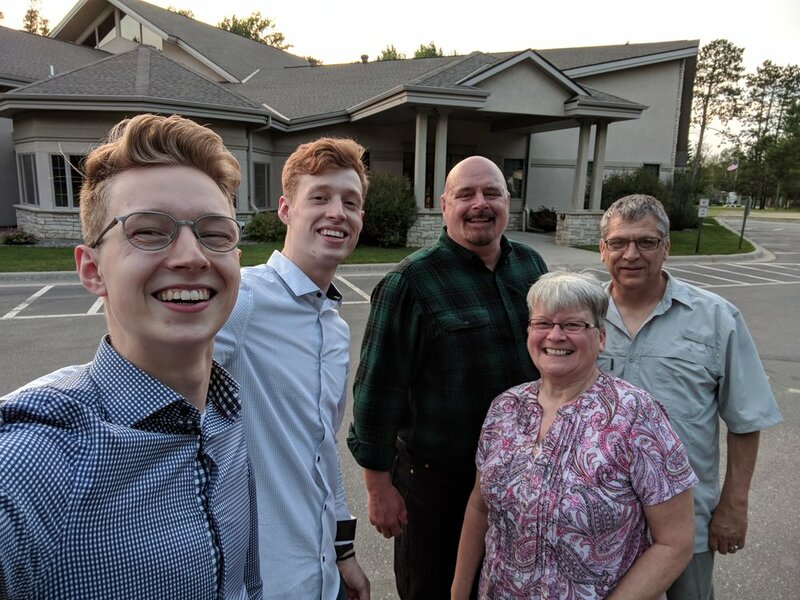 Growing up, Brayden and Brock cultivated much of their performance skills by practicing and performing in local retirement homes, discovering that residents thoroughly enjoyed their music. Residents often cannot get out to concerts in the community, so L'Ambizioso brings the concert to them. In addition to this pursuit, L'Ambizioso regularly volunteers and fundraises as Ambassadors for the Arthritis Foundation. How many people has L'Ambizioso reached through touring? L'Ambizioso has performed for over 15,000 people in concerts all around the nation, ranging from private events to nationally broadcasted events. Since the Duo's official origin just over a year ago, the estimated number of people that have connected with L'Ambizioso (via video views, website traffic, etc) reaches well into the hundreds of thousands.